There used to be a Home Depot Expo five minutes away from our house. Once in awhile, I'd head over there and wander the aisles, checking out maple cabinets, caressing stainless steel refrigerators and ogling high-tech washers and dryers. I always found it incredibly soothing to be in those perfect-kitchen setups, perhaps because life when Max was young felt so out of control. The Expo closed, and I lost my favorite appliance hangout. 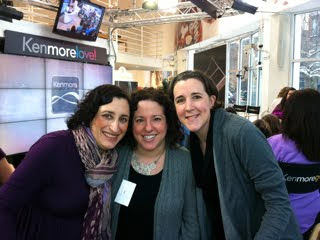 So when the Kenmore people invited me to Chicago for The Kenmore Blogger Summit 2012, I was psyched. It's a brand I know and trust. Plus, I love me a good trip. As it turned out, I picked up all sorts of interesting information (and a nice price break for you). The event was held in the Kenmore Live Studio. About 40 bloggers came, including my pals Laura and Amy from ChambanaMoms. 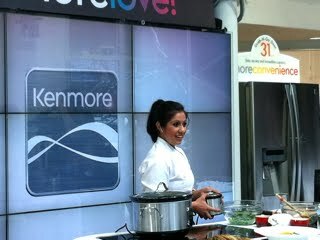 There were fun cooking events and other demos, held at the Kenmore Live Studio (you can watch live demos there several times a week at the LiveStream Channel). Chef Suzy Singh (from the second season of Master Chef) showed us how to make Kitchari, a traditional Ayurvedic dish, in a slow cooker; it's vegetarian, totally easy to make, and very yummy. (The lovely Wendy from Around My Family Table has the recipe.) She shared some good tips including cleaning yours with distilled vinegar before each use and rinsing with hot soapy water. She also noted that slow cookers take twice as long to cook stuff then when its made at a high temp; cooked on low for eight hours makes meat slice-able and at 10 hours, you can shred it. 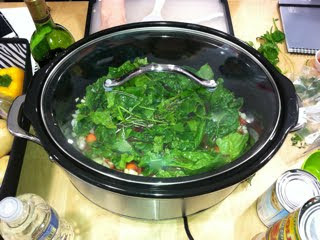 Then we split into groups for a Slow Cooker Challenge. Mercifully, nobody in my group noticed that I can't really cook. We made a rather awesome lentil-spinach soup; I have to say, I excel at stirring.. Shout out to Maura from The Other Side of the Tortilla for being an awesome cook and Heather from Rookie Moms who is an amazingly good sport. Amy from Google+ Plus talked about Search Plus Your World, a new search tool that delivers public search results along with personalized results—relevant tips, posts and photos from people within your circle. The editor-in-chief of Wired.com, Evan Hanson, spoke at length. He mentioned that niche content is the future. I loved this Geek Dad post he mentioned, The 5 Best Toys of All Time, featuring stick, box, string, cardboard tube and, oh yes, dirt. There was a white board for scribbling your tech suggestions. Mine: A fridge with a juice dispenser (although, come to think of it, a wine dispenser would be lovely, too) and LoveToast, a toaster feature that imprints slices with a heart, start, smiley face, whatever. 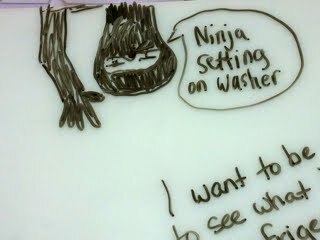 The winning idea: a dry-erase board on the front of the fridge. Another great idea. Oh, and I just thought of another one: A fridge that cooks for you. YEAH! 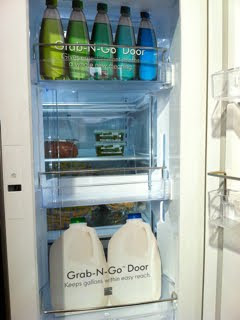 The Grab-N-Go helps prevent all that cold air from escaping as kids stand there, pondering (and pondering!) what they want. And it would surely help those times when one of the kids reaches for a drink in the back of the fridge and somehow manages to spill it all over. 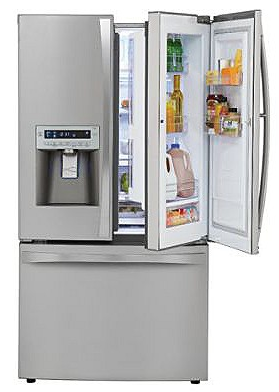 It has more space than any other Kenmore fridge, a Slim In-Door Icemaker that leaves plenty of room for door storage, GeniusCool technology that makes operation quiet and energy-efficient, super-sized drawer storage, an AirTight Crisper to prevent wilted veggies. Yep, I want one too. 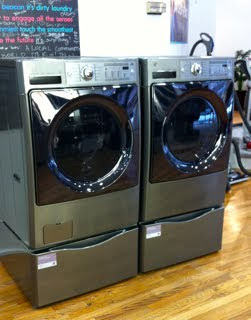 I also coveted these state-of-the-art Kenmore Elite Front Load High-Efficiency Steam Washer and Dryer. Our pair got water damage in Hurricane Irene, though they've never once broken down and have served us faithfully (um, make that "me" because as was recently revealed, Dave doesn't do laundry). I did a lot of research before I bought them; they were top-rated by Consumer Reports, and still are. The washer has SmartMotion technology that allows users to custom-clean all kinds of fabrics; steam in the washer gets stuff extra clean. The dryer has Steam Refresh technology that refreshes clothes by relaxing wrinkles and reducing odors, which is much better than Sabrina's method of pulling clothes out of the laundry and rewearing them. 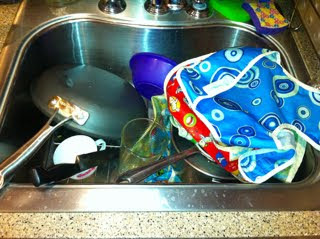 A sink that loads dishes into the dishwasher. Kenmore shared a 30 percent off coupon for small kitchen appliances, cookware, bakeware and gadgets. 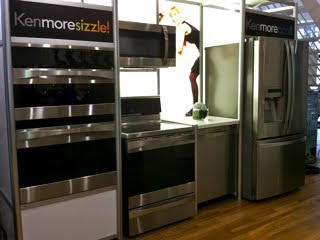 You can browse here and enter 30KENMORE at checkout, it's good through 2/4/12. What large or small appliance are you most lusting after these days? Note: Travel and accommodations were provided by Kenmore. Looks like you had a great time, and that 5 Best Toys Of All Time article is great! i would really like one of those ovens i keep hearing about lately where you can set two different temperatures at the same time to cook two different things - i don't know how it works, or when i would use it (not much of a cook) but i do know... i want it.